Work continues on construction of the McAllen Youth Baseball Complex Tuesday, Nov. 28, 2017, in north McAllen. 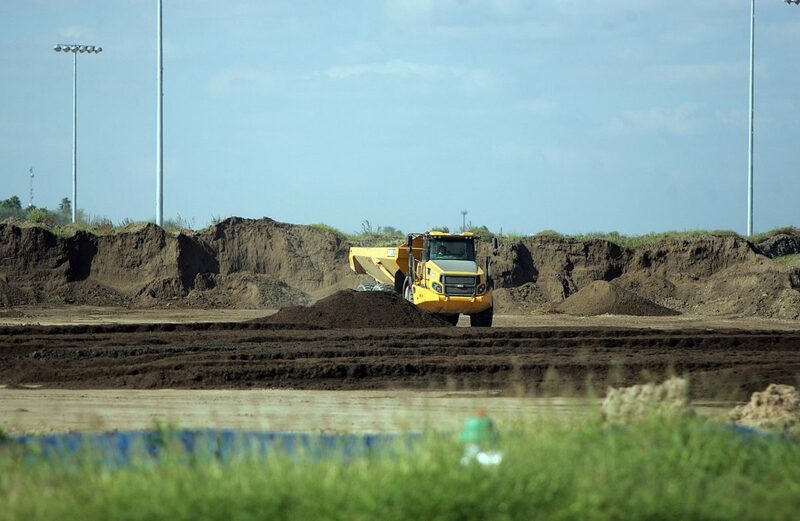 McALLEN — While completion of the city’s youth baseball complex continues to be delayed, play at the site will not. Despite delays from the contractor, who cited rains and Hurricane Harvey, City Manager Roel “Roy” Rodriguez said the 11-field, “state-of-the-art” complex will “probably” be ready by mid-February. Parks and Recreation Director Mike Hernandez previously set a completion date for mid-November, but it was pushed back to December due to Harvey and other weather-related obstacles. The complex, located on the corner of 29th Street and Auburn Avenue, is expected to have grass grown by March, Rodriguez added. The first tournament is in April and the complex will be ready, he said. It was paid for through a $15 million bond issue approved by McAllen voters. There will be provisions for potential development of one additional Miracle League field, which would comply with Americans with Disabilities Act standards. Construction on the complex began in February 2017. In 2016, a completion date was set for April 2017, but bids came in higher than city commissioners anticipated, so they rejected the bids in September 2016. Commissioners ultimately accepted and awarded the project in November 2016 to Hellas Construction, an Austin firm that specializes in building sports complexes. Hellas came in as the lowest bidder, at just over $9 million. Five other bids — all local — came in higher. The funding for the baseball complex was one of three separate propositions in a 2013 bond election. One other proposition that passed was for $15 million toward the Performing Arts Center, which opened in late 2016 and had a successful first year, selling 85,696 tickets and hosting 199,817 attendees, according to city records. The PAC is currently in its second season of shows. The final proposition that passed was for another $15 million, toward street improvements, which have been broken up into more than 10 separate projects. Several are finished while others are expected to be completed this year.